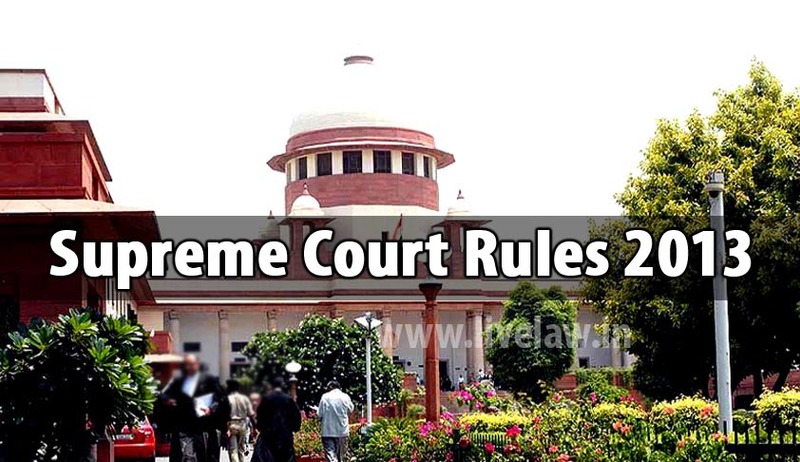 Changes have been introduced into the rules according to which the apex court of the country functions. These have come by way of a gazette notification on the new regulations, to be called the Supreme Court Rules, 2013. The notification replaces the SC Rules, 1966. The maximum period for summer vacations has been reduced from ten weeks to seven weeks. A few duties of the Registrar have been transferred to the Secretary General. The Secretary General shall now have the custody of the records of the Court. In the absence of the Secretary General, the functions of the Secretary General may be exercised by the Registrar nominated by the Chief Justice. Official seal will also be kept in the custody of the Secretary General. A proviso has been added to Order IV 1(a) that reads: Provided that an advocate whose name is entered on the roll of any State Bar Council maintained under the Advocates Act. 1961 (25 of 1961) for less than one year shall be entitled to mention matters in Court for the limited purpose of asking for time, date, adjournment and similar such orders, but shall not be entitled to address the Court for the purpose of any effective hearing. Also, for an advocate to be registered on record, the registration fee has been increased from twenty five rupees to two hundred fifty rupees. New rules have been added in Order IV which relates to Advocates. Instructions, for representation by a person other than the Advocate-on-record for a party, will be granted by an advocate-on-record or permitted by the Court. In petitions or appeals received from jail or a matter filed by a party-in- person or where a party-in person as respondent is not represented by an Advocate-on-Record, the Secretary General/Registrar may require the Supreme Court Legal Services Committee to assign an Advocate. c) Failure to submit appearance slip duly signed by the advocate-on-record of actual appearances in the Court. Another provision has been made in order to safeguard the interests of the parties. A newly designated senior advocate won’t be allowed to appear as senior advocate till he reports to the Registry that parties represented by him earlier have been so informed of his designation as senior advocate and that necessary arrangements have been made for the parties to make appearance before the Court in all the cases represented by him till then. However, the implementation of such a rule seems very hazy. Applications to appoint or discharge a next friend or guardian of a minor or a person of unsound mind and direct amendment of the record thereon. Applications for consolidation of appeals and writ petitions for purposes hearing, and preparation of record. Issue of fresh summons and notices. Application for amendment of pleadings with the consent of all the appearing parties, or where the other side has not appeared. The Rules also provide for adjudication of cause, appeal or other proceedings arising out of a case in which death sentence has been confirmed or awarded by the High Court to be heard by a Bench consisting of not less than three Judges. section 3 of the Indian Majority Act, 1875 (9 of 1875) where the appeal, petition or other proceeding relates to any of the matters mentioned in clauses (a) and (b) of section 2 of that Act or to any other matter. As regards serving of application under proceedings against minors or persons of unsound mind, it provides for serving the application on the mother in the absence of the father. The mother was not mentioned in the rules previously. Another change brought about in the rules provides that if the Court deems fit, it could issue notice to the minor as well. No decree passed against a minor shall be set aside merely on the ground that the next friend or guardian for the appeal, petition or other proceeding of the minor had an interest in the subject-matter of the appeal, petition or other proceeding adverse 10 that of the minor, hut the fact that by reason of such adverse interest of the next friend or guardian for the appeal, petition or other proceeding, prejudice has been caused to the interests of the minor, shall be a ground for setting aside the decree. The rules also empower the minor from obtaining relief from the Court available under any law, alleging misconduct or gross negligence on the part of the guardian or next friend, in case such conduct has prejudiced the interests of the minor. In case of extension of time for filing pleadings, the Registrar would now be permitted to grant just one extension, instead of two, for the purpose exceeding four weeks. Where any party is dissatisfied with the decree or order as settled by the Registrar, the Registrar shall not proceed to complete the decree or order without allowing that party sufficient time to apply by motion to the Court, which shall not exceed 90 days from date of order of the Registrar failing which the Registrar will proceed to settle the decree(emphasis applied). This cap of 90 days has been newly included in the rules, functioning as a barrier against delay mechanisms. Order XIII talks about ‘Copying’ elaborately, with Form no. 29 providing the format for an application for "certified copy" or unauthenticated "copy" to be sent by post to the Registrar, Copying Section, Supreme Court of India, New Delhi, along with the requisite copying fee for urgent/ordinary delivery. In cases where the deponent is a pardahnashin lady, the rules provide for affirmation or taking of oath before a lady Registrar which shall include an Additional Registrar, duly authorized by the Chief Justice, or before a lady Oath Commissioner, and shall also be identified by a person to whom she is known and that person shall prove the identification by a separate affidavit. According to the amended rules, the Registrar may refuse to receive a petition on the ground that it discloses no reasonable cause or is frivolous or contains scandalous matter but the petitioner may within fifteen days of the making of such order, appeal by way of motion, from such refusal to the Court (emphasis applied). This cap of 15 days has been introduced by way of the amendment. Where the Court, after hearing an appeal, decides to reserve its Judgment, the date of pronouncement shall be notified by the Registrar in the daily cause list instead of the Registrar notifying the parties through their Advocates-on-record of the day appointed by the Court for the delivery of the Judgment, as provided by the rules earlier. Also, in case a party to a Special Leave Petition or an appeal, who appears, does not have an e-mail address, a statement to that effect shall be made. Even in case of appeals and application by indigent persons, where the party is not represented by an Advocate of his choice, the Court may in a proper case, direct the engagement of an Advocate from panel of Supreme Court Legal Services Committee or at the cost of the State. The fee of the Advocate engaged at the cost of State shall be fixed by the Chief Justice, unless otherwise directed by the Court. It also states that, The State concerned shall pay the fees specified in the certificate issued under sub-rule (2) to the Advocate named therein within three months from the date of his presenting before it his claim for the fees supported by the certificate. If the fees are not paid within the period above-said, the Advocate shall be entitled to recover the same from the State concerned by enforcement of the certificate as an Order as to costs under the Supreme Court (Decrees and Orders) Enforcement Order, 1954. Along with a petition of appeal under the Section 23 of the Consumer Protection Act, 1986, at least 3 spare sets of petitions and papers filed with it will have to be provided instead of seven sets. A notable change for filing such appeals is that a Bank draft for Rs. 50,000/- or fifty percent of the amount whichever is less, required to be paid by the person intending to appeal, in terms of the order of the National Commission, drawn in favour ofthe Registrar, Supreme Court of India, payable at New Delhi. This amount will remain in the Suitors’ Fund Account till the disposal of the appeal or till such time as the Court may direct. disbursed as per the direction of the Court in that behalf. The fixed Court fee has also been increased from Rs. 250/- to Rs. 5000/-. Rules regarding Public Interest Litigations, curative petitions and for reference made by the Central Government/ Statutory Tribunals under Statutes have also been added separately. The application for review shall be accompanied by a certificate of the Advocate on Record certifying that it is the first application for review and is based on the grounds admissible under the Rules. Curative Petitions shall be governed by Judgment of the Court dated 10'" April, 2002 delivered in the case of Rupa Ashok Hurrah v. Ashok Hurrah and Ors. in Writ Petition (C) No. 509 of 1997. As for the petitions, along with the name and registered address of the advocate-on-record, his e-mail address will also have to be provided. Where the respondent appears, his registered address will have to be provided in case there is difference in address given in the petition and the actual address ofthe respondent. In order to avoid delay in the service of the notices, a proper procedure has been provided for effecting service on Union of India or State Govemment(s) as respondents. Also, the service of notice on the said Standing Counsel/ Advocate/In-charge of the Central Agency Section/ Special Officer/ Resident Commissioner shall be treated as sufficient service on the concerned Government or any of its Departments. Additionally, where 'dasti' service (i.e. service through party) is directed or allowed, the party shall (unless permitted otherwise), within fifteen days of issue of dasti, tender the 'dasti' notice to addressee in person and obtain an acknowledgment of service from the addressee. In case the addressee declines to receive, or acknowledge the service of, notice the party shall move the principal civil court (other than High Court) within local limits of whom addressee resides (or carries on business or personally works for gain), for service through special bailiff, the process fee/charges for which shall be borne by the said party. The concerned court shall direct expeditious service of notice through special bailiff and cause a report of service to be sent to the Registrar of this Court by registered /Speed Post A.D., the charges for which shall be paid by the concerned party, and forward a copy ofthe said report through the party, for being submitted to this Court. The rules put a cap on the commission that can be payable where a party seeks payment of the monies or securities paid to the Registrar or deposited with him, limiting it to Rs. 15,000. For the issuance of a fresh identity card, fifty rupees will have to be levied instead of three rupees. Besides, fee for registering a clerk of an Advocate or a firm of Advocates has been increased from Rs. 5 to Rs. 100 and the fee payable on requisition for issue of an identity card in substitution of one that is lost or damaged, has been increased from Rs. 3 to Rs. 50. The fee to the Amicus Curiae has been increased to 6,000/- up to admission stage and 10,000/- on final disposal stage or hearing on regular side after admission/grant of leave, or as directed by the Court/Chief Justice. The ready list will be called the terminal list, and will be published on the notice board/website of the Court at the end of each week a list of cases to be heard in the following week as far as possible in the order in which they appear in terminal list.